In Part 5, the children were over the moon singing “God Bless America” at every opportunity. We sang for soldiers, and made our own God Bless America book for families, writing and illustrating all the words to the song. Children still wanted more- I could tell. Milly to the rescue to make a God Bless America quilt. The Intrepid Museum in NYC was interested in the quilt! The USS Intrepid was a US Navy aircraft carrier commissioned in WWII and in service through the Vietnam war. When it was decommissioned in 1974, Zachary Fisher rescued the ship. It was restored and opened as a museum in 1982. I did not know of Zachary Fisher. He becomes important to the quilt later on. 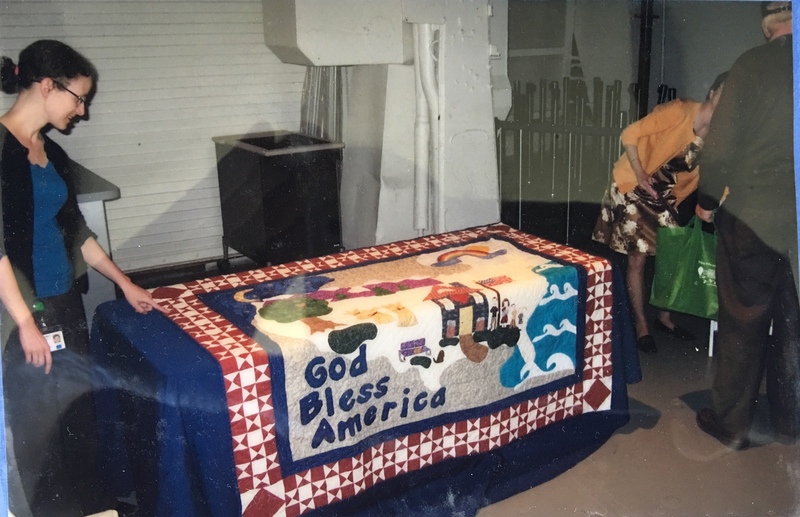 The quilt was put on display in the central part of the ship. The Curator and other staff were present to see it and give us an official welcome. The public visited the quilt, oohing and aahing, and asking Milly questions. And then, the children were asked to sing! With Milly’s beautiful voice leading the children, “God Bless America” could be heard throughout the ship. There were school groups who stopped by, excited to see the quilt and ask questions. I enjoyed asking them to find different parts of the song on the quilt, much like an I Spy. That was fun! As our visit was nearing an end, Jessica the Curator pulled me aside to have a talk with me. A few weeks later Jessica called. “Okay.” My heart was pounding. “I understand.” My heart was sinking. “Okay.” My heart was soaring. So, the God Bless America would take another twist and turn. Milly thought this was one of the best adventures. “Jennie, we had a great trip to the Intrepid. They wanted to see the quilt and have us visit. And now, there is something new.” I just love(d) Milly. First, I received a phone call from the head of the Fisher House Foundation. Obviously the Intrepid Museum had been in touch. They’re located in Rockville, Maryland. We decided it would be appropriate and fun for the children to deliver the quilt themselves to a Fisher House in Boston. In that way, it would be more ceremonious and meaningful. And, more children and families could attend since this would be nearby- not in New York City. The Fisher House could then mail it to the Foundation. Perfect. Or so I thought. We arranged for this big event. Everyone wore red, white and blue. We all met at the Fisher House, which had just been built that year (an important part later). Beth, the Director, greeted Milly and the children with such warmth. We were escorted into the living room where we unveiled the quilt. Beth’s eyes were as big as saucers. She hadn’t said anything. Then she said, “Will you please excuse me while I go make a phone call?” When she returned, I never expected to hear what she was about to say… stay tuned for Part 7. 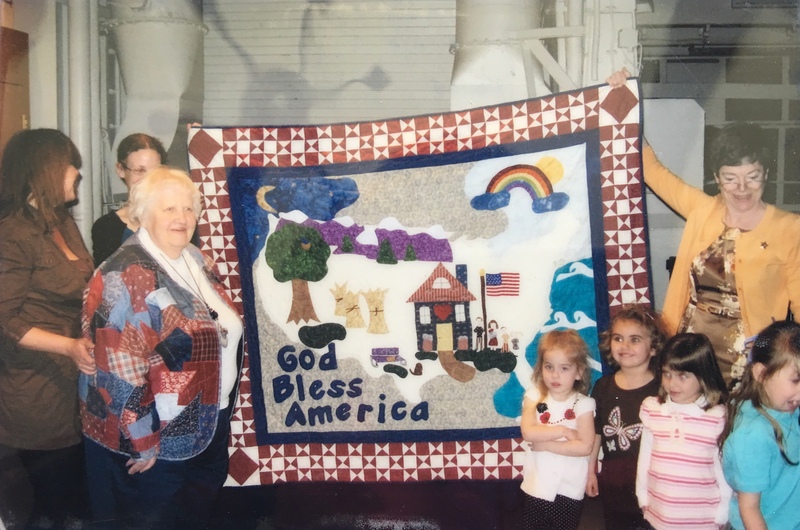 This entry was posted in art, Early Education, Giving, history, Imagination, Inspiration, military, museums, patriotism, quilting, Singing, Teaching young children, wonder and tagged Fisher House Foundation, Imagination, Inspiration, Intrepid Museum, Milly the Quilter, quilting, Quilts and museums, Teacning children, USS Intrepid, Zachary Fisher. Bookmark the permalink. Indeed! And it’s not over yet… Thank you, Opher. You are good at cliffhangers!! What an amazing story. Wow, what an adventure. Now, I’m putting down all my painting chores and waiting for the next installment. Oh, I suppose I can paint and wait, but you know my priority, now. Nice story and such a great thing to do, Jennie et al. Just redid the laundry room. Something tells me that there will be another ‘honeydo ‘ before too long. 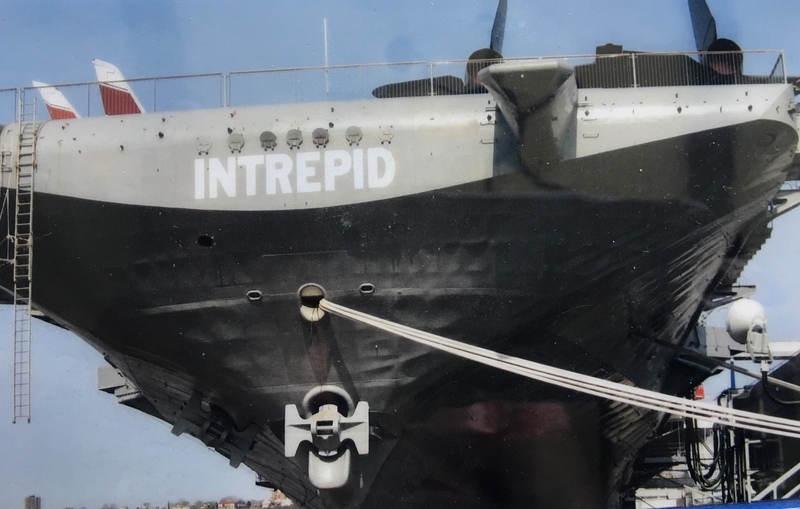 Great story about the Intrepid. What a day that must have been. Milly was part and parcel of so many adventures!! This story gets better and better. Thanks, Jennie. I echo everything written above (including “this story gets better and better,” which is exactly what I was thinking as i read John’s comment). I also love that “God Bless America,” a song written by Russian immigrant Israel Baline aka Irving Berlin (who fled as a small child about the same age as your students from ongoing anti-Jewish persecution in Tsarist Russia) is such an important theme/leitmotif in your saga. I. too, look forward to future installments!!! I feel the same way, Will. When I did some research on Irving Berlin, his roots spoke to me. I’m sure the children notice that I sing the song with a heart as big as the moon. Another interesting fact is that he decided to give the proceeds of the song to the Boy Scouts of America. Thank you, Will. Your comments are so appreciated. i’m impressed with the depth of your teaching. 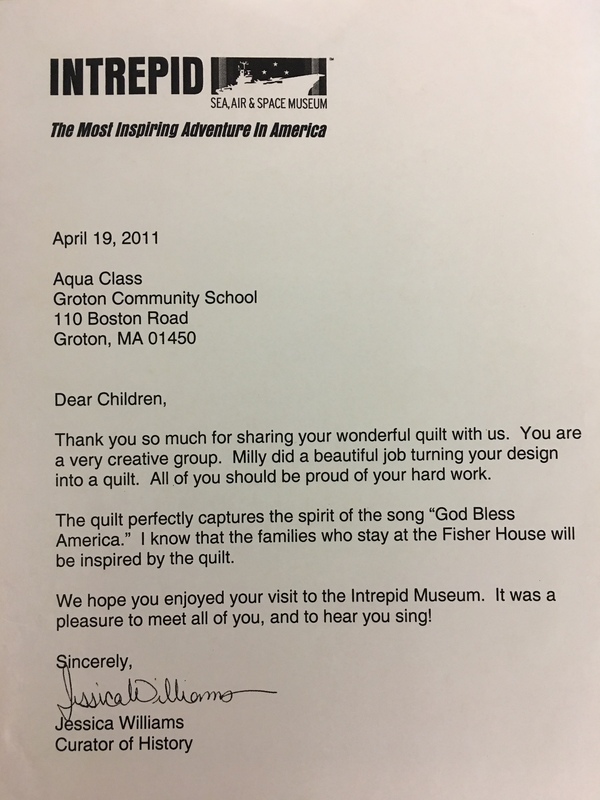 Oh Jennie, what another twist to your amazing story of this Quilt.. And Oh how wonderful that couple of hours must have been in Intrepid. I know how I enjoyed my tour of the Royal Yacht ” Britannica” birthed in Edinburgh Scotland on our visit last year. So I know How trilled the children must have been..
I’m so glad you enjoyed this, Sue. Yes, another twist, and even more. That day on the Intrepid was wonderful, I’m sure it was like your tour of the Britannica. 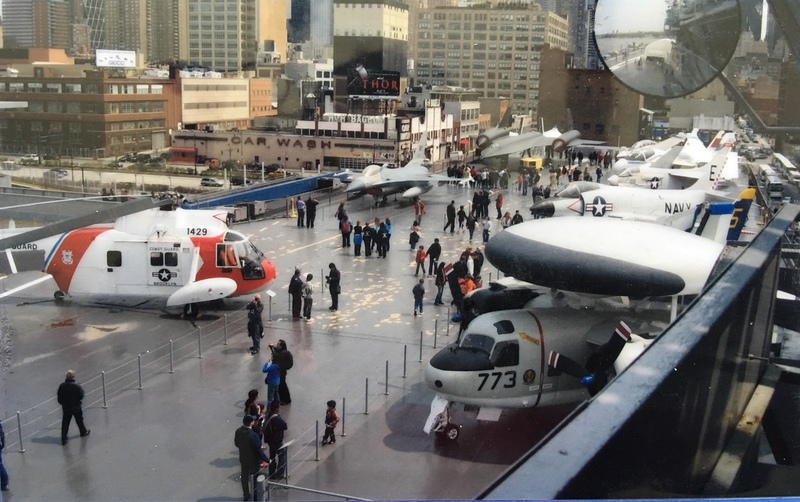 Parents and children still talk about the Intrepid. Thank you so much, and hang onto your hat! Thanks, Debby. It really was a fantastical voyage! Hard to believe there is still lots more ahead. The pleasure of writing all of this confirms and reinforces the amazing voyage of the quilts. I can’t even imagine leaving behind such a legacy, Jennie. You honor Millie well with this series. Hugs! Ooh, Jennie. I can’t wait for part 7. Post it quick! A cliff hanger, Jennie. You had better write part 7 quickly. So very exciting. It is so wonderful that you were able to find someone like Milly to help turn your ideas into reality. Yes, some things are in the stars or our life plan. Robbie, apologies!! I had just typed a reply to Debby, so I called you Debby. Sigh! No problem, Jennie. I have been known to do that too. Such an exciting history to where the beautiful quilt ends up. Funny how things work out in sometimes peculiar ways, or how being told no can really turn into a bigger YES! A cliff-hanger! Ack! What a great adventure. Can’t wait for part 7! Thanks, Diana 😀. Oh, there is more. Part 7 soon. Oh my gosh I have goose bumps! What next? Sitting on the edge of my chair waiting to find out! The children as well as you and Milly had some wonderful experiences because of the quilts. I can hardly wait for the next chapter. So much intrigue. Jennie, Once again, this is wonderful! Here is the next installment in Jennie’s wonderful series! Patriotism is more than being proud of where we came from….It is about having pride in what we try to be to each other, about the struggle to rise above and present our better angels to the world. Amazingly it is always the children who help us to see the simplicity of things… starting with the joy of being part of creating something important together!